Posted on March 30, 2017 , in Hot Tubs. If you aren’t a fan of maintaining your hot tub, you aren’t alone. But slipping on maintenance can cause damage to your hot tub that can be expensive to fix. Below, you’ll learn our top tips for maintaining your hot tub so it stays in perfect condition for longer. If you find that you’re frequently falling behind on maintenance, making a schedule is a great way to keep yourself on task. First, make a list of required maintenance tasks and how often you need to perform them. Remember that if you use your hot tub more frequently, you may need to do some tasks more often, so always pay attention to your manufacturer’s recommendations. Use these timelines to put together a monthly schedule, spacing the tasks out over time so you feel less overwhelmed. One of the best ways to prevent hot tub issues is to conduct proactive maintenance. There is a wide range of products that can help you do this. A weekly chlorine or bromine shock will help keep bacteria at bay. Keep in mind that this process can create a lot of foam, so have a foam reducer on hand to tackle this problem. Another terrific way to keep problems at bay is to use a de-scaling product if you have hard water. Because of the high levels of minerals in hard water, scaling can cause major damage to hoses and pumps. It can also make your tile look dingy. A de-scaling product will protect your hot tub’s internal components from damage and keep it looking cleaner. Even if you don’t have hard water, using a de-scaler one to two times a year will prevent residue in the future. Finally, by cleaning your hot tub just three times per year, you’ll help the components last longer. To keep your water as clean as clear as possible, there are several strategies you can use. First, install your hot tub away from trees or roads. This will prevent dirt and debris from entering your water, seriously cutting your maintenance time. Rinsing your filter with warm water on a weekly basis and cleaning it monthly will also keep your water clearer. Also make sure to conduct a pH test daily to ensure that your water is in balance. If it isn’t, you’ll want to adjust your chemicals right away to prevent expensive future repairs and scale buildup. Keeping your pH in check is also one of the best ways to save yourself time and energy. If you notice that your water isn’t as clear as it could be, body oils might be the culprit. Even if you don’t mind water that is a little cloudy, body oils can build up and cause internal damage to your hot tub, so you’ll want to address this issue as soon as possible. The easiest way to keep unwanted oils from beauty products and lotions out of your hot tub is to request that your guests shower before they take a soak. If you notice a serious water clarity issue, changing your water is the most effective way to fix it. If you change your water every three months, your clarity issues will become a thing of the past. From serious repair issues to routine maintenance, your dealer is the best resource for keeping your water and your hot tub in excellent condition. Whether you need your filter cleaned, your pipes flushed, or your components adjusted, a dealer can help. Professional service can be extremely helpful for hot tub tasks you can’t do on your own like cleaning out the strainer basket, jets, shells, and water lines. Not only can a professional clean your hot tub for you as needed, but they can provide you with tips for how you can improve your maintenance to keep it running strong. A good dealer will also have vast knowledge of products and accessories that will improve your maintenance experience. 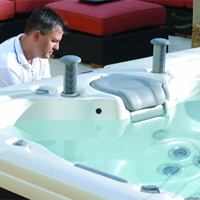 An experienced professional will also have the knowledge to improve your hot tub’s functionality. For example, if your hot tub isn’t providing the great massage that it used to, they can adjust the jets to improve it. If you know there just isn’t enough time in your day to properly maintain your hot tub, your dealer likely has a service plan that will help you keep up. Even if you’re a pro at maintenance and don’t mind doing it, getting a professional cleaning and inspection once a year can help you stop any problems before they start. Now that you’ve learned a few new tricks for keeping your hot tub in great shape, find out more about hot tubs that will simplify your maintenance efforts by downloading our hot tub buyer’s guide.